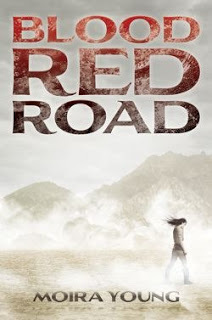 Super-funny Bookanista Carrie Harris is arguing for BLOOD RED ROAD by Moira Young today. She says, "Saba's voice is unlike anything I've ever read. So different, in fact, that I'm struggling with how to do it justice. It took me a few pages to fall into it, that voice, and then I couldn't get her out of my head. She's brave and heart-breaking and flawed and determined. That alone would have been enough to win me over, but Young takes this amazing character and plops her into an epic adventure, which is arguably THE MOST EPICALLY EPIC ADVENTURE EVER!" Find out what else she has to say on her blog.